1st century; feast in the Orthodox East is July 31 and March 27. We read about Joseph of Arimathea, the "noble counsellor," in all four Gospels (Matthew 27:57-61; Mark 15:43-46; Luke 23:50-56; and John 19:38-42). As with many of the Biblical figures, numerous legends accrued around his name in later years. Saint Joseph was a wealthy member of the temple council and a secret follower of Jesus because he was afraid of persecution from Jewish officials. He attended the Crucifixion, and French legend has it that he caught Jesus's blood as he hung upon the cross. (The presumed "Sacro Catino" or Holy Grail in which Joseph caught the blood of Christ at the Crucifixion is at San Lorenzo, Genoa, Italy.) Joseph persuaded Pontius Pilate to let him have Jesus's body, wrapped it in linen and herbs, and laid it in a tomb carved in a rock in the side of a hill, a tomb that he had prepared for himself. Later tradition has embellished this account. The apocryphal "Gospel of Nicodemus" relates that Joseph played an important role in the founding of the Christian community at Lydda. This version continues to say that, after the Crucifixion, Saint Joseph returned to Cornwall, bringing with him the chalice of the Last Supper, also known as the Holy Grail. The Holy Grail was hidden and played an important part in the folk history of England in the great national epic about King Arthur and his knights who unsuccessfully seek to find it. Upon reaching Glastonbury, he planted his staff, which took root and blossomed into a thorn tree. This is the Holy Thorn, which flowers at Christmas. King Charles I baited his wife's Roman Catholic chaplain by observing that, although Pope Gregory had proclaimed a reform of the calendar, the Glastonbury Thorn ignored the Pope's decree and continued to blossom on Christmas Day according to the Old Calendar. One of Cromwell's soldiers cut down the Thorn because it was a relic of superstition. We are told that he was blinded by one of the thorns as it fell. A tree grown from a cutting of the original Thorn survives today in Glastonbury (and trees propagated from it stand on the grounds of the Cathedral in Washington, DC, and presumably elsewhere) and leaves from it are sold in all the tourist shops in Glastonbury. William of Malmesbury's treatise on the "Antiquity of Glastonbury" (in competition with Westminster) was the source of the 13th-century legend alleging that Joseph accompanied Saint Philip (f.d. May 3) to Gaul to preach. Philip then sent Joseph at the head of 12 missionaries to England. It is said that the company, inspired by Gabriel the archangel, built a church made of wattles in honour of the Virgin Mary on an island called Yniswitrin, given to them by the king of England. (Some versions even claim that Jesus Himself consecrated the church.) The church eventually evolved into Glastonbury Abbey in Somerset. Supposedly Joseph died there, was buried on the island, and miraculous cures worked at his grave. This burial site is unlikely though. Is there any merit to the legends of Saint Joseph? Perhaps. Tin, an essential ingredient of bronze, was highly valued in ancient times, and Phoenician ships imported tin from Cornwall. It is not unreasonable to believe that some first-century, Jewish Christians might have been investors in the Cornwall tin trade. Christianity gained a foothold in Britain very early, perhaps, in part, because of the commerce in tin. If so, then the early British Christians would have a tradition that they had been evangelized by a wealthy Jewish Christian. Having forgotten his name, they might have consulted the Scriptures and found that Joseph and Saint Barnabas (f.d. June 11) fit the description. 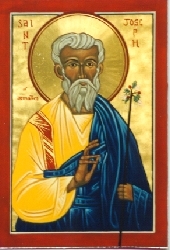 Because much of the life of Barnabas was already described by the "Acts of the Apostles" making him an unlikely candidate, only Joseph was left. Thus, Christians seeking an immediate connection with their Lord, grasped on to Joseph as their evangelizer. The Glastonbury legend had the effect of fostering devotion to the details of the Incarnate Jesus and His Passion. It also played a role in Church politics. At the Council of Constance (1414-1418), Glastonbury claimed seniority by claiming that England had received Christianity before any other Western country (Attwater, Attwater2, Benedictines, Bentley, Delaney, Encyclopedia, Farmer, Robinson, White). In art, Saint Joseph is portrayed as a very old man, carrying a pot of ointment or a flowering staff or a pair of altar cruets (containing the blood and sweat of Jesus) (Farmer, White). He may be shown taking the crown of thorns from the dead Christ. At other times he is shown with the shroud and crown of thorns, a thorn tree by him, or a box of spices (Roeder). He is venerated at Glastonbury and patron of grave-diggers and undertakers (Roeder, White). and having embalmed It, laid It in a new sepulchre. and wrapped Thee in clean linen and spices. yet he restrained himself with fear. Glory to Thy condescension, O Lover of mankind.